George Van Eps wrote three books on manipulating chords called Harmonic Mechanisms for Guitar. It’s full of things to do with chords. Very full :) This exercise is the kind of thing he does in the book. Here I’ve written spread voicings for the diatonic triads in C major, and the idea is to suspend the third by playing the 4th and then resolve each chord. In C they are all perfect 4ths apart from the one on F maj which is a #4th. You could reverse this by playing the triad and then moving the third to the 4th. Then the next chord’s third will be the 4th that you just played. Instead of 4 to 3, try 2 to 3. Then focus on the 5th. Go 6 to 5, then try 4 to 5. Try 7 to 1, 2 to 1. So far all the movements have been diatonic. Try moving the notes chromatically. E.g., do a semi-tone above the 5th to the 5th for each chord. 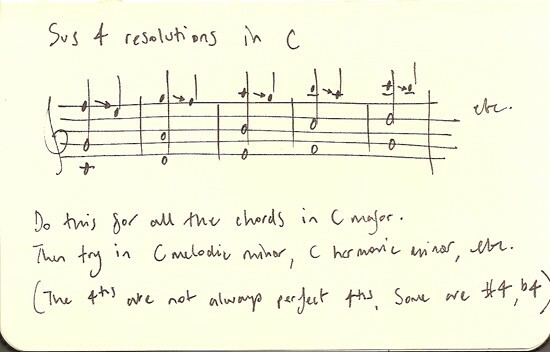 Or try resolving two notes at once. 4 to 3 and 6 to 5. i.e., CAF to CGE. Then try this in different scales and modes.